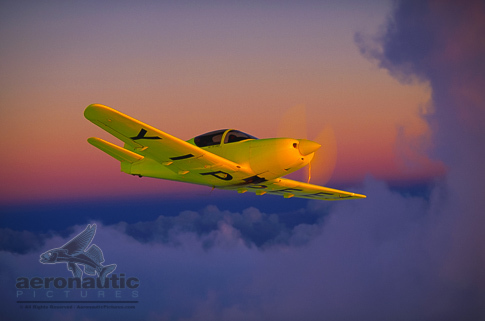 Aviation Stock Photo – LoPresti Swiftfury Picture: A stunning air-to-air image of the Roy LoPresti-designed Swiftfury airplane shot in a beautiful and colorful Florida sunset. This aerial stock photo is available for digital download on royalty free terms. Seen on the belly of the aircraft is word Yippee!